What is a hologram? A hologram is a recording in a two- or three-dimensional medium of the interference pattern formed when a point source of light (the reference beam) of fixed wavelength encounters light of the same fixed wavelength arriving from an object (the object beam). When the hologram is illuminated by the reference beam alone, the diffraction pattern recreates the wave fronts of light from the original object. Thus, the viewer sees an image indistinguishable from the original object. There are many types of holograms, and there are varying ways of classifying them. For our purpose, we can divide them into two types: reflection holograms and transmission holograms. Although mass-produced holograms such as the eagle on the VISA card are viewed with reflected light, they are actually transmission holograms “mirrorized” with a layer of aluminum on the back. The typical transmission hologram is viewed with laser light, usually of the same type used to make the recording. This light is directed from behind the hologram and the image is transmitted to the observer’s side. The virtual image can be very sharp and deep. For example, through a small hologram, a full-size room with people in it can be seen as if the hologram were a window. If this hologram is broken into small pieces (to be less wasteful, the hologram can be covered by a piece of paper with a hole in it), one can still see the entire scene through each piece. Depending on the location of the piece (hole), a different perspective is observed. Furthermore, if an undiverged laser beam is directed backward (relative to the direction of the reference beam) through the hologram, a real image can be projected onto a screen located at the original position of the object. Between the reflection and transmission types of holograms, many variations can be made. 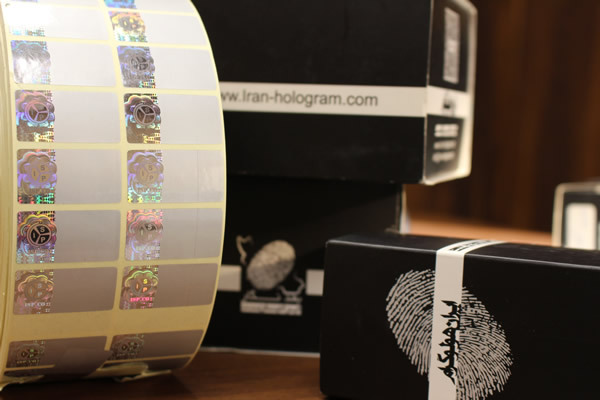 To mass produce holograms for authenticity applications such as security hologram stickers or the holograms you find on on credit cards, currency and passports, a two-dimensional interference pattern is pressed onto thin plastic foils. The original hologram is usually recorded on a photosensitive material called photoresist. When developed, the hologram consists of grooves on the surface. A layer of nickel is deposited on this hologram and then peeled off, resulting in a metallic “shim.” More secondary shims can be produced from the first one. The shim is placed on a roller. 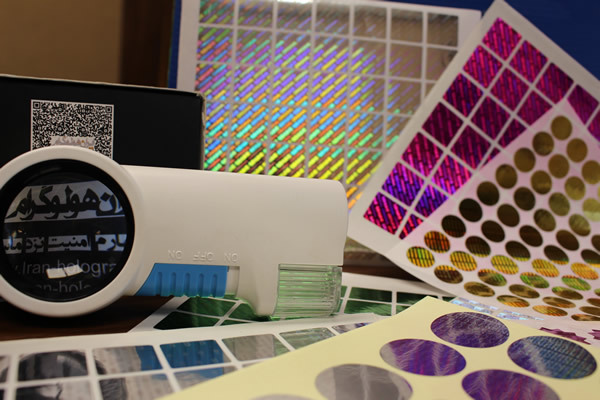 Under high temperature and pressure, the shim presses (embosses) the hologram onto a roll of composite material similar to Mylar. Embossed holograms are actually a combination many types of holograms. A transmission or reflection hologram can be made from a series of photographs (usually transparencies) of an object—which can be a live person, an outdoor scene, a computer graphic, or an X-ray picture. Usually, the object is “scanned” by a camera, thus recording many discrete views. Each view is shown on an LCD screen illuminated with laser light and is used as the object beam to record a hologram on a narrow vertical strip of holographic plate (holoplate). The next view is similarly recorded on an adjacent strip, until all the views are recorded. When viewing the finished composite hologram, the left and right eyes see images from different narrow holograms; thus, a stereoscopic image is observed. Recently, video cameras have been used for the original recording, which allows images to be manipulated through the use of computer software. Microscopic changes on an object can be quantitatively measured by making two exposures on a changing object. The two images interfere with each other and fringes can be seen on the object that reveal the vector displacement. In real-time holographic interferometry, the virtual image of the object is compared directly with the real object. Even invisible objects, such as heat or shock waves, can be rendered visible. There are countless engineering applications in this field of holometry. With changes in the angle of the viewing light on the same hologram, completely different scenes can be observed. This concept has enormous potential for massive computer memories. The mathematics of holography is now well understood. Essentially, there are three basic elements in holography: the light source, the hologram, and the image. If any two of the elements are predetermined, the third can be computed. For example, if we know that we have a parallel beam of light of certain wavelength and we have a “double-slit” system (a simple “hologram”), we can calculate the diffraction pattern. Also, knowing the diffraction pattern and the details of the double-slit system, we can calculate the wavelength of the light. Therefore, we can dream up any pattern we want to see. After we decide what wavelength we will use for observation, the hologram can be designed by a computer. This computer-generated holography (CGH) has become a sub-branch that is growing rapidly. For example, CGH is used to make holographic optical elements (HOE) for scanning, splitting, focusing, and, in general, controlling laser light in many optical devices such as a common CD player.